Amos Oz (1939-2018), author of “A Tale of Love and Darkness” and other books, in conversation with Richard Wolinsky, recorded in San Francisco in November, 2004. 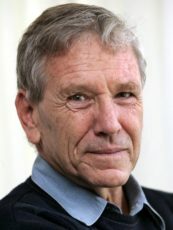 Amos Oz, the noted Israeli novelist, short story writer, essayist and peace activist, and perennial Nobel Prize candidate, died on December 28th, 2018 at the age of 79. The author of forty books, he was a firm believer in the two-state solution who felt, over the past decade, that the hope for peace appears to be slipping away. Today his greatest work is considered to be the memoir of his family, set against the background of the rise of Nazi Germany, World War II, and the formation of the state of Israel, and culminating in the suicide of his mother. A Tale of Love and Darkness, was published in Israel in 2002 and two years later in the United States.